There is overwhelming and compelling evidence as to the activity of terrorist groups in Southern Florida, groups which have planned and executed terrorist actions against the people of Cuba for decades in contravention of U. S. and international law. Every country has the right to defend itself and in that context, the Cuban Five acted in the least adversarial and nonviolent manner to prevent acts of terrorism without engaging in actions against the national security of the United States. The U.S. failed to take any action to prosecute the actual terrorists in Southern Florida. We find that men that are peacefully trying to prevent terrorism should not be in prison. This Peoples' Tribunal condemns the cruel and unwarranted treatment of the Cuban Five during their incarceration. We find the Trial was a political trial against the Five. We find there was no credible evidence to support a conviction of conspiracy to commit espionage against the Five. We find there was no credible evidence to support a conviction of conspiracy to commit murder against Gerardo Hernandez. We find the U. S. Government interfered in the trial by spending considerable sums of money to pay reporters to write over one thousand printed articles and other television and radio coverage amounting to propaganda which had the unequivocal effect of influencing the outcome of the trial. We find the court's decision to deny the motion for change of venue was patently unreasonable in light of jury intimidation and a pervasive environment of hostility against the Five. Therefore this Peoples' Tribunal concludes that the Cuban Five were unjustly detained, unjustly prosecuted, and unjustly sentenced, all contrary to international and U.S. domestic law including the U.S. Constitution. This Peoples' Tribunal proposes the convictions be quashed, and that Gerardo Hernández, Ramón Labañino, Antonio Guerrero, Fernando González Llort and René González be set free immediately, without any restrictions on their liberty. In the alternative, and in the interest of justice and healing, this Peoples' Tribunal proposes that the President of the United States should exercise his prerogative of a Presidential Clemency and allow the Five to return home. Letter to President Barack Obama from Toronto City Councillors. 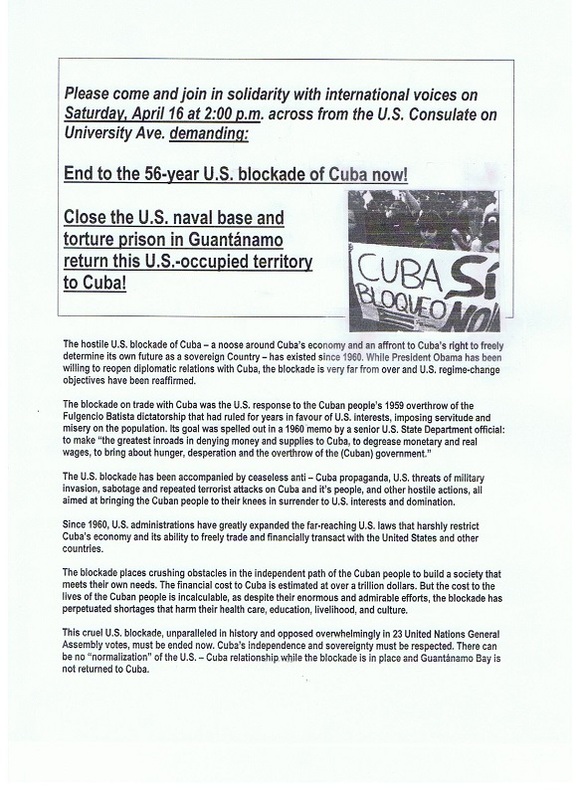 Letter to President Barack Obama from the Peoples' Tribunal & Assembly. Letter to Prime Minister Stephen Harper. 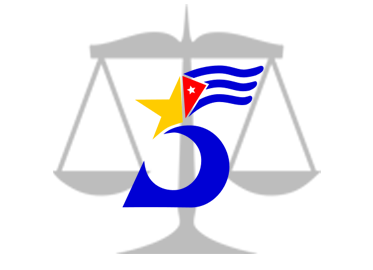 Attend the Peoples' Tribunal & Assembly – come and witness directly the proceedings of a unique quasi-judicial rendering that seeks to expose to the public all that went awry with the proceedings and legal trial in South Florida of five Cuban prisoners. It is an international opinion tribunal independent from state authorities. The Tribunal may use international human rights law and precedents of common law. To challenge the mainstream media's blackout so that they get involved in covering a story of what is very disturbing in the processes of the US justice system. The media has a choice either they cover an issue or they are complacent and tacitly ignore an injustice. It took a strong media to expose Watergate – the case of the Cuban Five is just as compelling– why the silence? Who gains from the silence? That is why; the outcry of thousands of concerned citizens over the past 15 years comes to a head, here in Toronto, at the Peoples Tribunal, be part of it! Who comprises the People's Tribunal? A panel of Magistrates of Conscience presides over the Tribunal. The Magistrates come from a wide cross section of highly respected members of the international community who bring their expertise to bear in hearing the case and rendering a final opinion. How will the Tribunal be run? The tribunal will take place on September 22nd. During the proceedings lawyers from Canada, Cuba and the US will provide details of the areas where there was the greatest miscarriage of justice in the courts of south Florida. The Tribunal will hear from impact witnesses and also experts from Europe, Canada, the US and Cuba. The families of the Cuban Five will bear testimony to their hardships concerning the barriers to prisoner rights and denial of visits imposed on them. What is the final outcome of the Tribunal? At the end of the proceedings the Magistrates of Conscience will render their decision, which will be published at the end of the session. Check the Peoples' Tribunal Poster and the Peoples' Tribunal Brochure for more information. Please note that cameras or video recording devices are NOT allowed in the council chambers unless you have the prior permission of the Peoples' Tribunal. Almost 14 years ago, the Cuban Five – René González, Gerardo Hernández, Antonio Guerrero, Ramon Labañino and Fernando González – were falsely charged and wrongly convicted in a Miami courtroom of "conspiracy to commit espionage" against the U.S. on behalf of the Cuban government. Ever since the unjust conviction, the five Cubans have been held in separate U.S. prisons, often in solitary confinement. 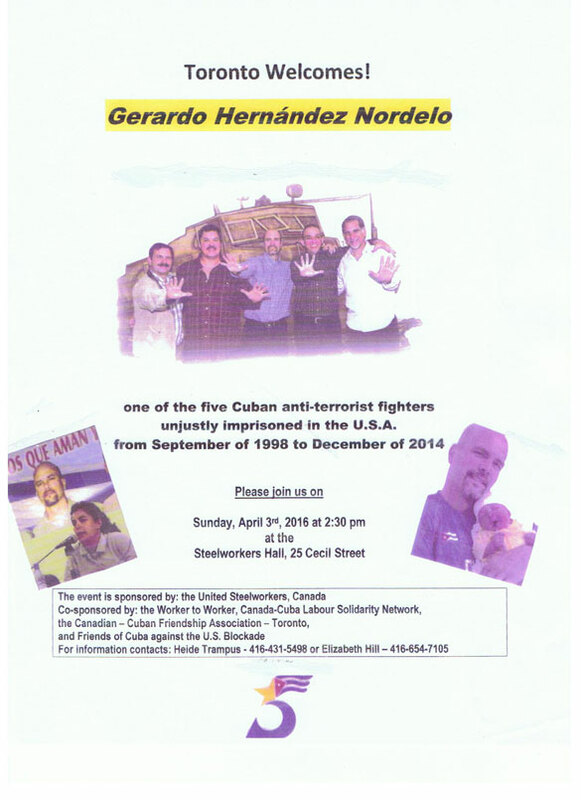 The Cuban Five were peacefully trying to do what U.S. law enforcement authorities have refused to do - prevent terrorism. As part of this international effort to achieve the freedom of the Cuban Five, a number of trade unions and solidarity groups from across Canada, in coordination with the Canadian Network on Cuba and La Table de concertation de solidarité Québec-Cuba, are convoking a Peoples' Tribunal & Assembly on September 21-23, 2012 in Toronto, to shed new light on this egregious injustice and to build a broad public campaign to demand their freedom.